June was Ohio Wine Month (here at TWAV we've decided to extend it through July, making it the month of "Junuly") and many wine drinkers will be flocking to their local wine shops to peruse the fancy-clad bottles adorning the shelves. Of course, like a book cover, the myriad of wine labels feature fancy artwork and lingo to woo potential buyers. But what do all of those fancy wine words really mean? Legs: The ribbons of wine that cling to the side of a swirled glass are legs, according to Christy Eckstein, the executive director of the Ohio Grape Industries Committee. The legs you see are related to the alcohol content of wine and sometimes to the sweetness level. In general, the higher alcohol content, the more legs there are. Thick, sweet wines often have more legs. Legs are easy to see and easy to talk about, but they are not necessarily connected to quality, she said. Reserve: This fancy sounding term means different things in different places. Spain and Italy, for example, have strict rules and qualifications for use of the term. The U.S. does not. In general though, reserve can mean a late harvest or grapes that are set aside for a specific product. Some Ohio wineries use the term for special wine that has been set aside. Late harvest and ice wine: Late harvest generally means that the grapes are left on the vine longer than usual. With the ice wine, the grapes are actually frozen while still on the vine. 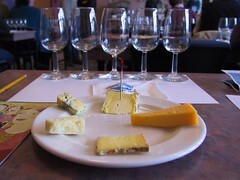 “The solids in the grapes don’t freeze but the water does, and that concentrates the sugars and flavors,” Eckstein said. “It could be Thanksgiving or Christmas before you get that freeze so you’ve got birds and animals going after the grapes, and it is more work to make.” As a result of the extra production challenges and highly concentrated product, ice wines are sold at higher prices and often in smaller bottles. Appellation: An appellation is a designated wine-growing region governed by specific laws. Ohio has five appellations including an island appellation with North Bass Island in Lake Erie, which is the Isle St. George Appellation. Estate bottled: There are three main parts to this. The wine must designate an appellation and both the vineyard and the winery must be located in that region. The winery has to have management over the vineyard that produced the grapes. The wine must also be produced from crush to bottle in a continuous process without leaving the winery premises. Those seeking Ohio wines should look for estate bottled wines or Ohio Quality Wines that are made with a 90% minimum of Ohio-grown grapes. “If they are looking for truly local Ohio wines, the Ohio Quality Wine program will really help them find wines made with locally grown grapes,” Eckstein said. As the international awards pile up and the standing of Ohio wines grows in world stature, more people are seeking out wines with Ohio appellations. The wine industry has been making dramatic strides in quality and quantity in recent years. The number of Ohio wineries has grown from 124 in 2008 to 143 in 2010, and wine production increased nearly 500,000 gallons from 2006 to 2008. Ohio wine production now contributes more than $580 million to the state economy and creates 4,000 jobs with a payroll of $124 million.